This simple setup is brought to you all the way from South Korea! The setup is not my original idea. Pattern #2 below was used by a KRA Coach during Lee Sang-Dong’s mock lesson as part of the Firefighter Equine Activity Workshop (he was a jockey for over 30 years and now teaches riding lessons!). I loved how simple the setup was and how the poles could be a simple way to give visuals and maintain safety while having riders ride together! 4 poles– 2 poles (brown in image to right) will be set up about 10-20 feet off the rail running parallel with the center line. The distance away from the rail will depend on if you are using this for one or two students. 2 poles (black) will be set up parallel with the midline. Leave a 1-2 foot gap in-between the poles so it is clear that they are separate. Have you ever been teaching your students and you tell them to go around a barrel, in between the cones, and stop next to the pole? Your instructions seem crystal clear to you yet somehow things get all jumbled…. rider goes over the barrel…another goes around the pole…and the third rider ends up doing their own pattern. Instead of just passing it of as ‘not listening’….consider the possibility that your students may not fully understand prepositions! They may know the words ‘around’ ‘over’ ‘past’ and others…but they lack the ability to take the word ‘around’ and apply it to taking their horse ‘around’ the barrel. Reinforcing prepositions while riding is a great exercise for both traditional and adaptive lessons…and the bonus is that the words used carry over into everyday life! Practicing prepositions and how to ‘ride’ them is a great way to strengthen the communication between you and your students and it is also a great exercise for you to stay mindful of using specific parts of speech, like prepositions to help give clear instructions to your riders. If your rider quickly catches on to following your instructions to go around, over, past, etc. then challenge them by having them tell you what they are doing as they make up a pattern using the poles. This pattern is also great for teaching riders about the terms perpendicular and parallel! Take time to explain the terms to them (tip: use a visual like this one here or draw out examples on a whiteboard). You can then talk have the riders go perpendicular to the poles by riding over them and parallel to the poles by riding next to them. Challenge your riders to call out if they are perpendicular or parallel to the current pole that they are walking by or walking over. Having your riders learn the terms parallel and perpendicular are great because they give you two more ways to be descriptive and specific about things in the lesson. For example, you could tell two students to ride along a line and stay ‘parallel’ to each other. You could tell a student to go walk parallel to a jump in the arena. You could tell your student to ride perpendicular to a certain letter or obstacle in the arena. Another set of terms you can incorporate are horizontal and vertical lines. Explain the terms to your students (Tip: use a visual like this one here or draw out an example on a handheld whiteboard). Then have them stand in a stationary place in the arena and help guide them through identifying which poles are vertical and horizontal to them at that time. 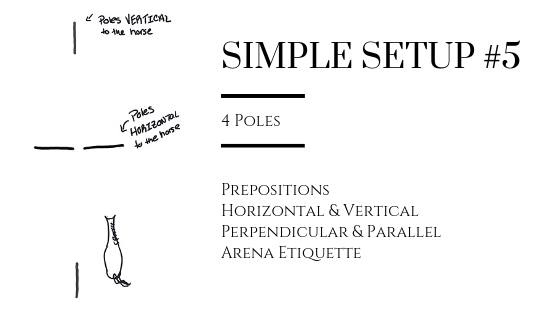 If your students catch on to the concept at the first location, try moving them to a new location and have them halt and identify the poles that are vertical and horizontal to them. An extra challenging way to incorporate this would be to have them moving around the arena and call out random poles so the rider has to not only locate the pole you are describing but if the pole looks vertical or horizontal to them at their current location. Again, these terms can be beneficial to you because you can go tell students to walk over the pole that is horizontal to the long rail or go over the jump that is perpendicular to the short rail. This pattern setup is great for teaching riders how to keep spacing when riding next to another horse and turning off of the rail. Start by having the riders ride side by side along the arena rail. Verbalize to them which one will turn before the guide pole and which one will turn after the guide pole. As they come to the first pole (brown), incorporate another reminder of who is turning and assist with a count down if needed. Once the riders have turned off the rail, have them continue over the poles (black) and then keep walking towards the next pole (brown). As they approach the next guide pole, verbalize which rider is turning before or after the pole. Note: Please school horses together with staff and/or volunteers before you attempt this with your students. Not all horses get along so this variation of the Simple Setup may not work well for your specific program. If you are utilizing volunteers in your class, also be aware of their location and don’t compromise their safety by having riders be to close and squishing volunteers between horses. This implementation of the setup is perfect for teaching your students how to pass another rider going the opposite direction and discuss ‘arena etiquette’. Arena etiquette is especially important to learn if your students ride in a group or go to shows. Learning arena etiquette are not just silly rules but are guidelines that help to keep all riders safe when riding together in an arena. The poles in the arena serve as a visual ‘barrier’ so that horses do not get to close to each other and the pole is also a stationary object that the rider can aim for. For some of the riders that we work with, it is easier for them to grasp the concept of walking their horse next to the pole so that the pole is on the left versus telling them to walk by another rider and have the other rider on their left. Have your riders walking along the arena rail (each going separate directions) then tell them to come to the middle and stop their horse so that the poles are on their left side. Once they are stopped they can hi-five each other. Use this time to explain that the setup they are in is what it looks like to pass ‘left to left’. Once the riders grasp the hi-five and passing left to left at the whoa, have them try it at a walk. If all goes well you could then have them pass left and left while they are riding on the rail and without the poles on the ground as a barrier and guide. Note: For those of us that live in countries that drive on the right side of the road, this exercise and riding skill can easily be applied to driving. You can talk to the students about how, just like when riding a horse, you have to drive your car so that you pass other drivers ‘left to left’ on the road. Remember that as an adaptive (therapeutic) riding instructor you should be focusing on teaching a riding skill(s) during your lesson and reinforcing them with a pattern. Don’t get stuck on teaching the pattern and leave out teaching the necessary riding skills. The patterns in this post are suitable for all ability riders. If you have a lower functioning rider that is still working on the fundamentals of position, reining, etc. then take the time to break your skills down and do a Super Fundamental task analysis of the skills used in this lesson. Incorporating prepositions and more technical terms like horizontal and vertical is a great way to challenge all of your riders….you never know what terms will stick even with riders we think may have trouble communicating. Some riders may be non-verbal or cognitively younger than their physical age but it does not necessarily mean that they can’t understand a wide range of words and/or keep growing their vocabulary. All of the patterns above can easily reinforce steering, transitions, looking ahead, etc. For ideas on how to incorporate these topics check out the explanations at the bottom of Simple Setup #3. Safe Spacing– What is safe spacing when walking next to another rider? What about behind a rider? What about when passing the rider going the opposite direction? How do you read your horse and the other horse’s body language to help avoid an unnecessary confrontation? Speeding up and slowing down– Teach your rider the hows and whys of using their natural aids to speed up the horse at the walk or trot. This is especially beneficial to focus on if you plan to have the students ride next to each other like they would do in Pattern #2.